Company logo changed to new Direct Action logo after rebranding. It’s a lightweight and versatile backpack designed for Military and Law Enforcement operators. This medium sized pack has a wide camo and solid color selection that also makes it a great choice for hunters and outdoor enthusiasts. You can also get it in snow camo - PenCott SnowDrift™ for winter activities. The camo/color selections with the low profile look and feel makes it a perfect Everyday Carry (EDC) bag. If you’re looking for a heavy duty MOLLE backpack for your laptop, tablet, iPad, hydration bladder, etc. or just a solid base for your bug out bag (BoB) – Dragon Egg® made by Direct Action® is the best value for your money. 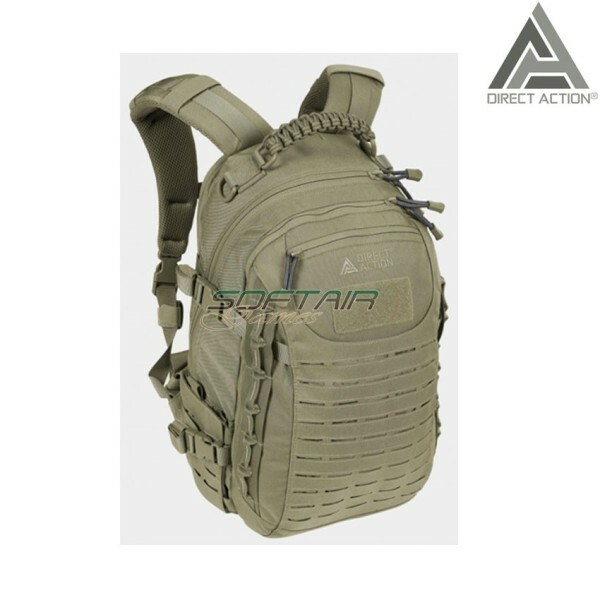 The Dragon Egg® Mk II is a 25+ liter backpack suitable for either short patrol duties or larger EDC pack. The pack features three zippered compartments. The main compartment has an internal hydration sleeve and mesh pocket. The main compartment also has a center tube exit for a hydration tube. The rear pocket features a padded sleeve which can be used for safely carrying multiband radio devices or up to a 15” laptop. The front pocket of Direct Action® Dragon Egg® features a zippered mesh pocket and internal organizer for notepads, GPS, writing utensil, and other small essentials. 2 redesigned side pockets can carry small and flat items. The pockets are equipped with elastic to expand to fit a standard U.S. canteen or 1 liter nalgene water bottle. The Direct Action® Dragon Egg® also has a soft velour lined zippered pocket for glasses, cell phone, etc. The pack also has daisy chain webbing that runs along the front panel seam for attaching any carabiners or similar gear to the pack. Laser-cut system compatible with MOLLE/PALS makes the backpack not only fully modular, but also still maintains a low profile look. Thanks to the egg shape, the pack has a smaller height and width than other packs with similar capacity and makes it more comfortable with belt kits or ballistic vests. Suspension system is based on comfortable shoulder straps and internal stiffener in the back. Waistbelt is detachable and can be stowed away. Heavy duty two-way YKK® zippers. Main compartment features an internal mesh and a hydration pocket. Two additional zippered external pockets. Redesigned side pockets that are equipped with elastic to expand. Additional zippered back compartment for hydration bladder or the padded sleeve can be used for carrying up to a 15” laptop. Paracord drag handle (contains of two 2.5m cords). Side and bottom retention straps with buckles. Daisy chain webbing for attaching extra gear/carabiners. Velcro panel (10.1 x 5.1cm / 4 x 2 in) for ID patches. Made of 500D Cordura® fabric. All clips and buckles are made by Duraflex®/WooJin. PenCott™, Kryptek™ and Multicam® camouflages are NIR treated.